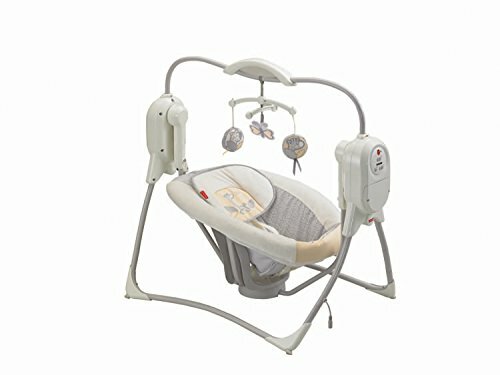 Fisher-Price power plus spacesaver cradle 'n swing: The same great features of Fisher-Price Cradle 'n Swings in a 40% smaller space saving design, and with a power plus adapter for optional battery-saver operation. Two different swinging motions help soothe and entertain baby, with music and nature sounds, and three soft toys on the overhead mobile. SmartSwing technology offers 6 distinct swinging speeds from low to high so you can find the motion to suit baby's mood-swinging side-to-side (like a cradle), or swinging head-to-toe. It actually senses baby's weight (so speeds won't slow as baby grows)-and it starts without a push.